If sublimity is a perfectly ripe watermelon, then where do 101 varieties take you? I used to think watermelon was pretty much watermelon. Aside from some variability in ripeness and sweetness, you taste one, you taste them all. I am pleased to report that, as with a select few other things, I was wrong. 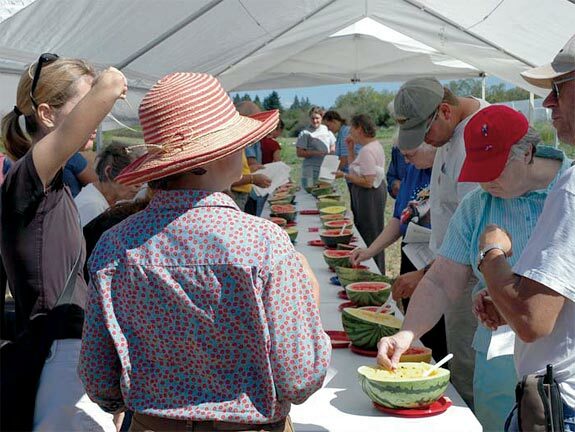 Last August  I was fortunate to be in Vancouver on the day that Carol Miles hosted her watermelon tasting. That summer, as well as the previous, Miles had conducted variety trials of small "icebox" watermelons, in order to determine their suitability for organic production by small farmers in western Washington. 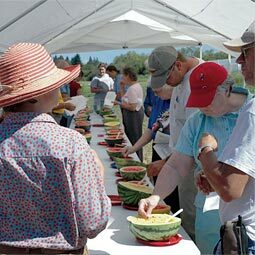 The immediate results were proffered on a long table beneath a tent in back of the Vancouver Research and Extension Unit, 101 varieties in a wide spectrum of red and yellow. I did not taste every one, though I tried—enough to convince me that I must always question my assumptions, for those melons wandered all over my sensory map, as wonderfully wide a diversity of flavor as of color, but also of firmness and juiciness. It's one of those benevolent jokes of evolution that the watermelon originated in the Kalahari desert of southern Africa. Although it is not known when the plant was first cultivated, watermelon harvest is depicted in 5,000-year-old Egyptian hieroglyphs. Watermelons were placed in Egyptian tombs, presumably as sustenance for the afterlife. By the 10th century, watermelon had made its way to China, which is now the world's largest producer. In 2004, China grew over 150,000,000,000 pounds of watermelon. The U.S., the fourth-top producer, grew just short of 4,000,000,000 pounds. That's approximately 115 pounds per capita for the Chinese, as opposed to about 18 pounds for each of us, which, if you've ever been to China, will come as no surprise. Then again, watermelon did not reach the U.S. until relatively late. There is some reference to watermelon being introduced to America Indians in the 1500s. French explorers found natives growing them in the Mississippi Valley. Watermelon was first cultivated in Massachusetts in 1629, and the first American cookbook (1796) had a recipe for watermelon-rind pickles. For some time now, Miles has been testing varieties of crops for small farmers and market gardeners—baby corn, wasabi, ginseng, and so forth. Although none of these crops will ever challenge our agricultural commodities such as wheat and apples, they present small growers with valuable additions toward diversifying their production and pleasing a local market. Perhaps the most dramatic result of Miles's trials arose out of her need to determine ripeness in order to reach an accurate comparison of the varieties tested. Melons must ripen fully on the vine. They have few starch reserves before ripening, so they do not continue to ripen after picking. In their initial trial in 2004, Miles realized they had no accurate way to determine whether a melon was fully ripe. Time-honored methods, such as thumping, turned out to be worthless. "For the life of me, we can't tell what's a 'nice hollow sound,'" says Miles. However, two other tests, when combined, turned out to be a perfect indicator. "Where the vine attaches to the melon are two little leaves," says Miles. "They're not true leaves, but like a cotyledon. When the tendril turns brown and the leaflets turn brown, it's ready." Unfortunately, this is not a test that can be conducted in the grocery store or fruit stand. So we watermelon connoisseurs must hope that Miles's findings are widely disseminated among growers. This year's  tasting—of 140 varieties—takes place on August 30. Everyone is welcome.